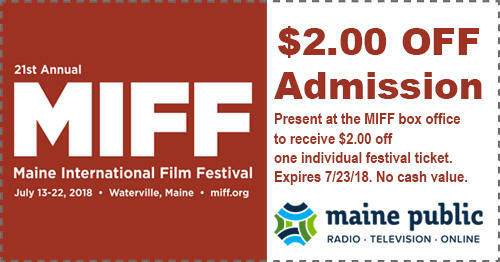 The Maine International Film Festival (MIFF), Maine’s oldest, largest, and most beloved film festival, is celebrating its 21st anniversary in Waterville, Maine. MIFF, known for its unpretentious and laid-back atmosphere, features the best of American independent, international, and Maine-made films. This 21st annual event promises to be the most exciting yet as organizers are planning to host a number of special guests (actors, directors, producers, executives and more) from around the world. Each year for twenty years, the historic Waterville Opera House and Maine’s premier art-house cinema, Railroad Square Cinema, open their doors for ten days of incredible film. In addition to screening some of the best films on the planet, this MIFF will feature exciting live performances, public art exhibitions, special VIP parties, free and open educational workshops, and other ticketed events. MIFF will also host the 41st annual Maine Student Film and Video Festival, a celebration of student filmmaking that provides the public an opportunity to see what Maine's youngest cineastes have created at a special film screening and award presentation. Maine Public plays a large role in this portion of the festival. Maine Public members do receive a ticket discount to this exciting festival. Either order your tickets online at miff.org and use the discount code MEPUB2018 at checkout OR print out the coupon on this page and present it in person at any festival venue.